Recipe - Winter Warmer Kale Soup with Optional Turmeric, suitable for vegetarians and vegans. Kale is one of the most nutritious vegetables, being a good source of vitamins, minerals, anti-oxidants and substances that protect eyesight, especially as we get older. It is also a good source of calcium for vegans. Unfortunately kale isn't the most exciting or appetizing vegetable in its own right, it needs to be combined with something else to make it more tasty and digestible. This is a recipe for a delicious and nutritious thick soup which is ideal as a winter warmer. In this recipe olive oil is used to solubilize the lutein and other lipophilic nutrients so that they can be taken up by the digestive system. - 500g fresh kale as whole leaves (avoid the ready-chopped kale stocked by some supermarkets as this is full of stalk and of uncertain freshness). - Stock cubes or bouillon powder sufficient for 1500ml of stock (typically seven vegetable Oxo cubes or five level teaspoons of Marigold vegetarian or vegan bouillon. Check the instructions on the packaging). Wash the kale leaves, then strip leaf portions from the central stalk, which should be discarded. Also discard any damaged or yellow patches of leaf. Put 300ml of water and 40ml (2 tablespoons) of extra virgin olive oil into the 3 liter pan, then add the leaf portions. These are quite springy when uncooked and will need a lid on top to press them down (see picture above) until they wilt and soften in the rising steam. 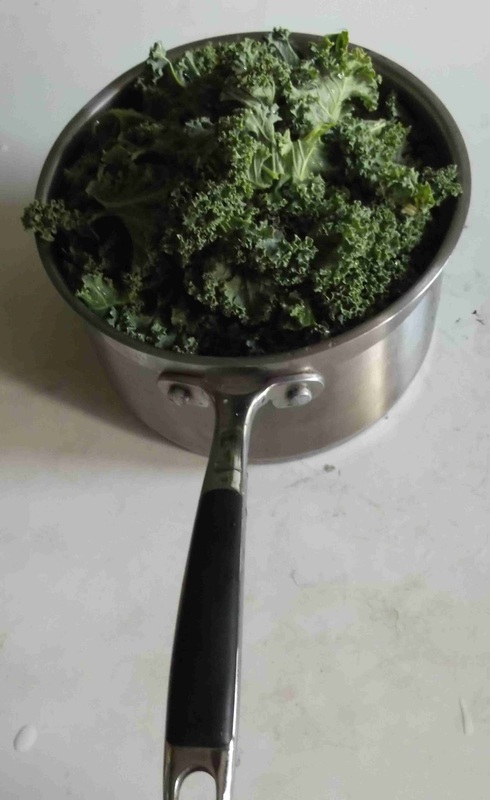 When the pan begins to boil, press the kale down with the spatula and stir occasionally to ensure thorough cooking and contact with the oil/water. Simmer for 15 minutes. Simmer the 350g chopped potatoes in 1 liter water till soft. Chop two medium onions and three cloves of garlic and fry gently in 40ml (2 tablespoons) extra virgin oil till soft. Add the crumbled stock cubes or bouillon powder to the simmering potatoes, remove from heat and stir well. Add the fried onion and any remaining oil from the frying pan and liquidize. Add the kale gradually (in five or six batches) and liquidize. Adding the kale in small portions avoids clogging the liquidizer. Add and mix the oil/water that the kale has been cooked in as this contains nutrients. Finally check for taste and add more pepper or stock if necessary. The soup can be frozen as portions in suitable microwaveable containers and reheated as required. You can supercharge this soup with anti-oxidants by adding two level tablespoons of turmeric and mixing well just before adding the stock powder to the potatoes. This will give the recommended daily dose of 1 teaspoon of turmeric per 250ml portion of soup. However, be aware that some people need to be cautious about taking turmeric, and it does affect the taste of the soup in a way that may not be to everyone's liking. So turmeric is probably best left out if you're preparing the soup as part of a meal for guests.